The most useful tools to quantify how hard you’re training are those metrics that account for both the volume and the intensity of your running. A systematic approach to quantifying training load that integrates both volume and intensity is the training impulse or TRIMPS system, first proposed by Calvert and Banister in the mid 1970s (1, 2). The TRIMPS system utilizes heart rate as the criterion measure though, and there are serious limitations to the use of heart rate as a measure of intensity which is why many runners use pace as opposed to heart rate to gauge intensity. Recently, Dr. Andrew Coggan addressed some of the limitations inherent to the TRIMPS system when he developed the training stress score or TSS system for cycling (3). TSS in cycling uses power as the criterion measure of intensity, and this overcomes many of the limitations associated with the use of heart rate when quantifying intensity. Since running speed is function of power, and for most runners, speed or pace is the measure of greatest interest, we can use the same principles applied in the TSS system to quantify training stress in running. 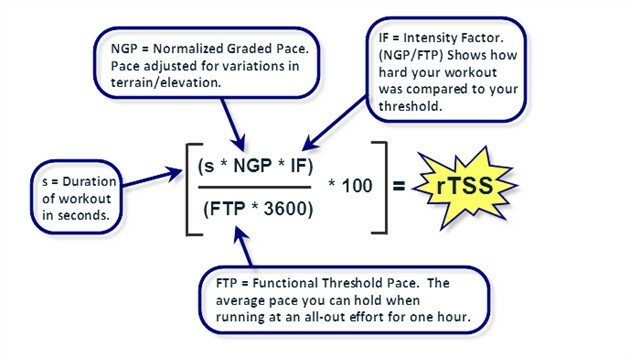 In particular, the elements of the normalized graded pace (NGP; info here), relative to the functional threshold pace (FTP; info here) in conjunction with the duration of the workout we can determine an appropriate rTSS score for each workout. The stressfulness of any given pace is determined in relation to your current functional threshold pace (that is, the fastest running pace you could sustain for one hour). The calculation makes adjustments for hills (for example, a hilly 40-minute run at a steady pace of 8:00/mile would generate a higher TSS than a flat version of the same run) and even for the fact that running at any given pace becomes more physiologically stressful the longer that pace is sustained. This can give us an apples to apples comparison for training stress incurred by a track workout versus a long steady run versus a fartlek run, or any other workout. It provides the framework by which we can see the big picture, or the forest despite the trees. Want to learn more about rTSS and other important TrainingPeaks metrics? Check out our online course for everything you need to know to take your training to the next level. Stephen McGregor, Ph.D. is an innovator in the development of training concepts and software designed to maximize the benefits of running with a speed and distance device. Most notably, he created the normalized graded pace (NGP) algorithm and the run training stress score (rTSS). 'Dr. McGregor is Associate Professor and Director of the Applied Physiology Laboratory at Eastern Michigan University and has published and presented numerous research papers examining muscle injury, nutritional supplements, performance modeling, and running physiology.